“If one is driven to the edge of sound and requested to hear the future of jazz, whoever is spinning the tunes might consider the Josh Shpak Band to open the show with music from Astatic . 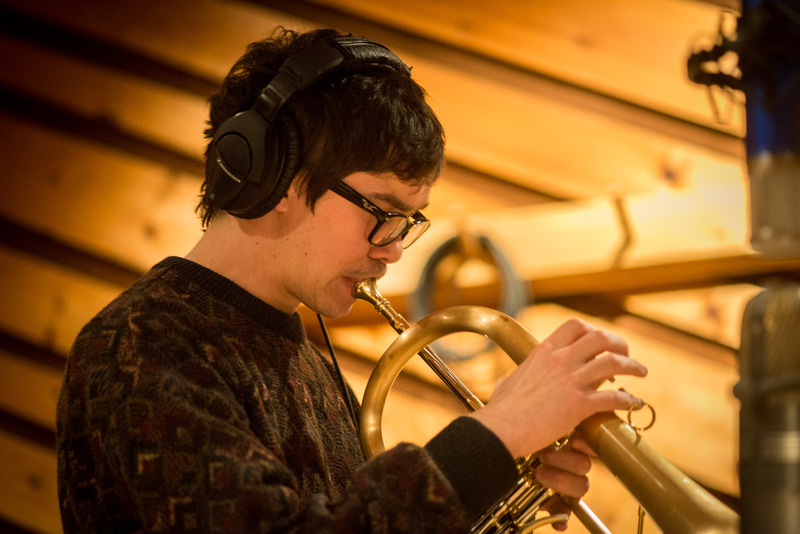 Led by trumpet prodigy Josh Shpak, who was personally mentored by the legendary Clark Terry, this outfit is propelled by the vitality of youth and exuberance with a wisdom well beyond their collective years. The cosmic throb which opens “The Vibe,” leads to the trumpet lines that moan into a twisted dirge. Guitarist Lucas Del Calvo compliments the horn with a bridled bravado, as they rise into progressive heights, before settling back to the pulsation where they began. “From Different Places,” is briskly steered by the piano of Kyumin Shim, setting up a free flying episode that weaves through fusion funk, breaking past discerning guitar and trumpet solos, tumbling into to the vibraphone expressions of Simon Moullier. The bass work and drumming on this number by Aaron Liao and Patrick Simard, respectively, is as tight as can be played on such a complicated tempo. These two do an admirable job throughout this production, and should be acknowledged. For the rest of the tracks, beginning with “Prelude: Through My Eyes” a string section was brought in to add an orchestral timbre to the project. This is where this group demonstrates that they are deft at executing complex arrangements, while maintaining the jazz edge. “Weapons,” features Roni Eytan on chromatic harmonica, who eases the song into a trance mode, offering interesting interactions between himself and Shpak. The pace is alleviated more on the aptly titled “Requiem,” where the band relaxes upon the strings, yet maintains the somber mood necessary. “Not Just Yet,” is deliberate in its sparseness, and seems appropriate for ending this stimulating and innovative endeavor.